Love his expression. He's giving you the big eye. love the suggestions and the ribbon. and streetpigeon's "Brahms, Early Beatles and Firetruck Sirens. Why Do You Ask." Yes officer, I do have a license. "Brahms, Early Beatles and Firetruck Sirens. Why Do You Ask"
Looks kind of menacing, but I'll bet she's/he's a sweetie. 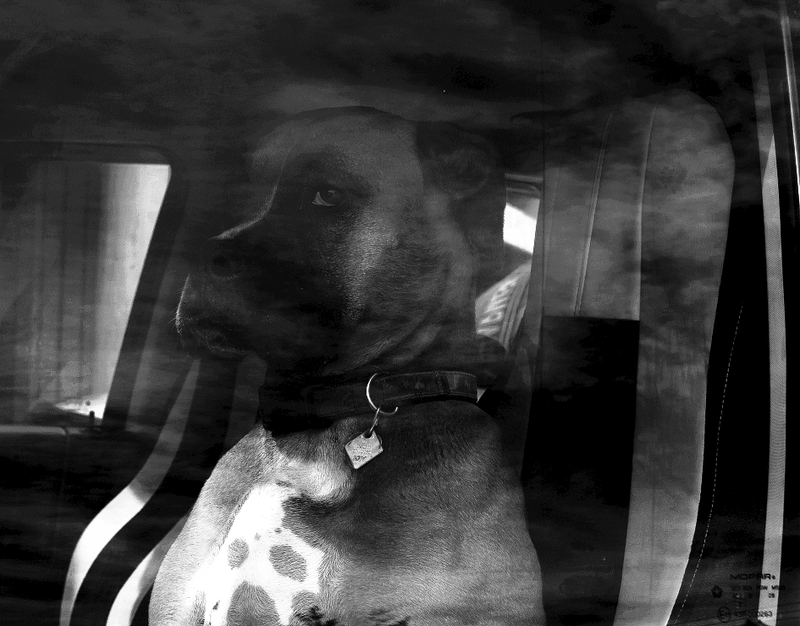 The reflections transform the photo into something atmospheric and mysterious, but only in furtherance of a finely posed dog in a car and with a glint in his eye. Nice. Did I do something wrong, officer? Officer, do you want to see my driver's licence? Steal my car? Dare you. This paparazzi crap is getting a bit old. Why no ossifer I have not seen any cat.....Breath TEST...Why do you want me to take a Breath Test???? Daddy are We There Yet? You go in the crate, I'm riding up front! My Eldest who just looked over our shoulders: Please, not the Pound! What, never seen a dog drive before?? "Boxed In, & Spoiling for a Fight"
Get lost or I'll make nose prints all over your window. This reminds me of what used to happen in the dark room when your negative got stuck in the spool while developing. Proudly hosted by Sargasso Networks. Current Server Time: 04/24/2019 07:50:51 AM EDT.